So happy I had the letter sent from Santa! I had ordered a letter from Santa to be sent to my grandson who is four. He was thrilled to see his name and address and told him mom he really better be good now! HO HO HO SANTA SAID ! HOPEFULLY MY NIECE AND NEPHEW WILL LOVE THESE LETTERS FROM SANTA. CAN HEAR THEM SAYING MOM, DAD, WE GOT A LETTER FROM SANTA. My grandkids loved the letters from Santa.Just hearing the joy in their voices was priceless. Very nice Santa letter . I'm sure my daughter going to love it. We loved our letter from Santa and the little ornament with my son's name on it. We plan on doing this every year for him. Thank you! The price was not bad for the wonderful letters. There are two excited little boys! This is the perfect letter from Santa for the child tettering on the brink of no longer believing. It is encouraging, positive and applicable to most children. It was well received by the person that got it and believed for another year. These letters are just perfect for children. I had the Santa letter sent to my grandson, Gavin.....he loved it! My kids have not gotten their letters yet, it is only October, but we order these every year. They are a nice treat and even my older kids (21 and 22) look forward to getting their letters in the mail. It has been at least 10 years and I will continue to order more and more as I begin to have grandchildren. Is 4yr. The two in the middle are 9yr. I will continue sending Santa Letters, as long as they enjoy them!! I love the things you have. I've ordered this Santa letter for my Granddaughter for 15yrs now. She still doesn't realize it's from Grammy. Puts a smile on her face every year, plus the ornament as a momento of Christmas's pasted. I have purchased the Santa's letter s every year for a long time now. My grandkids look forward to them every year. Great Surprise for a child. Got this for my Grandson. He loved the idea Santa write him & told him he's been a good boy. Lol He loved his name on the ornament also. My Granddaughter looks for this every year.Makes her day to receive it. I ordered Santa letters for my grandchildren. They were both delighted to receive a letter from Santa. Oh boy the smiles thinking they were very important to the big man of him taking time out from his busy schedule to write a letter to them. A beautiful crafted letter addressed to them wow with their personal name on envelope + in the letter. Thank you the letters were received before Christmas. What I like is you can not find this stuff in any store. Makes it great to shop. Prices are good also.Ordered a Santa letter for my Grandson. He loved it and that it was in his words COOL! You want different stuff for gifts. This is the place to shop. Braden received his Santa letter today. He was thrilled! He has been getting Walter Drake's Santa letters, I think since he was 2 yrs old. He looks forward to them every year. We will be ordering next year. Would have made a better impression had the names been spelled wrong...l even telephoned in the order and the names were spoken and spellchecked by your customer service representative. Please do better next year. Your site would not allow me to process the order either, that is why l called in my orders. Not worth what I paid for. This is a great idea and I love Christmas and I want my kids to keep believing.. Great Job!! I thought it would be fun for some young children to receive a letter from Santa. In one instance I was told the older brother "no longer brlieved". When he saw his younger brother's letter and ornament he said, "I hope I get one. I still sort of want to believe", hence only one letter purchased this order. I sent one to my grandson last year and he loved it! My Grand children love to receive the letter from Santa each year!!!! Wish you had more of them to choose from!!! These are our 2 great granddaughters and wanted them to have a letter from Santa and the ornament for a keepsake from us. I’ve been sending these Santa letters every year to my grandson. He loves them and is extremely happy that Santa sends him an ornament. I also just got one for my granddaughter who was just born in October of 2018. For my Great Granddaughter who will be 4 Jan. 28, 2019. Got her one last year and she loved it. I don't understand $5.99 shipping for a 50 cent stamp. The children always enjoy letters from “Santa” and always get excited to receive mail. Not to mention again the price was a lot better than others. So that my daughter could receive a letter from Santa as her sister did. We have young Great grand children and they get the biggest joy to receive a letter from Santa and the tree ornament with their names printed on it is something they will cherish for years to come. Walter Drake is special as they are the only company that has the ornament with the letter. Have purchased in the past. These 2 are a very young niece and nephew. Thought it would be fun for them as I live in MN and they live in TX. I sent my kids 'letters from Santa' from Walter Drake and now I send them to my grandkids! So easy to order on this site. I had problems on two other sites and I gave up. I tried on your site and was easy as always. Thank you so much !!! 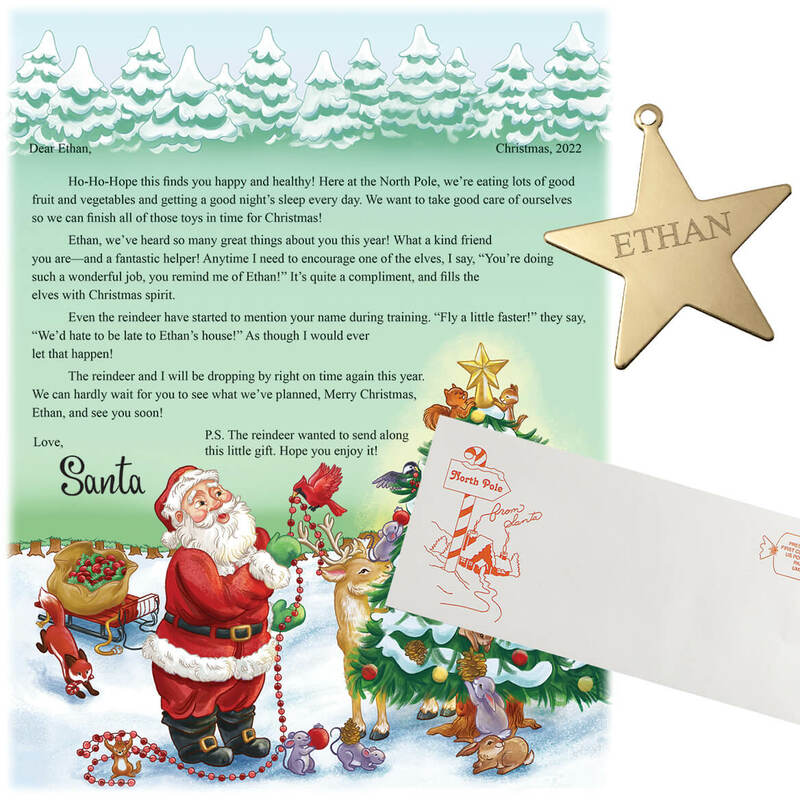 Only letter from Santa for our grandkids with a personalized ornament--at a great price! Can't wait for them to get and see their reaction! This is a fantastic idea for my grandchildren. I'm sure they'll be very surprised and feel very special. It was very affordable until you add on handling charge. You think your getting a great deal with the shipping and it ends up costing you more. Prices and it is simple and easy to place a order. 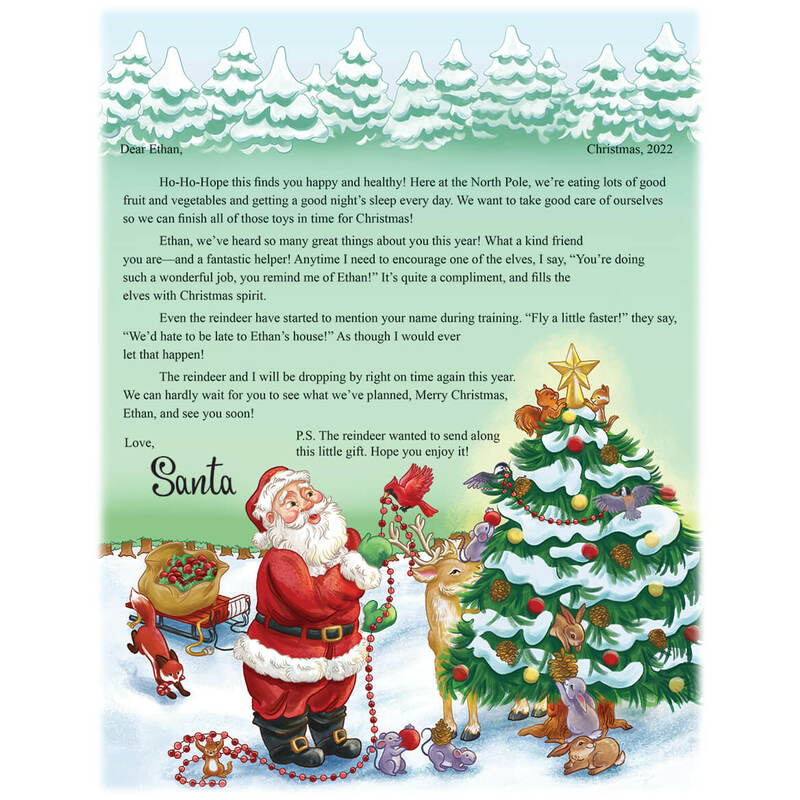 Good quality, nice writting, very colorful and the children will love getting their own letter from Santa. My father would get these for my children and now I get them for their children. The ornaments are not as sturdy as they used to be but the letters are a nice keepsake. I ordered this last year and my great nephew loved it! He was thrilled as the smile on his face said it all - he said I knew Santa was for real! He is so worried right now because they just moved and I know he will be just as thrilled when he receives this letter because he is so worried that Santa won't know he knew address. I assured him that Santa sees and hears every thing! I can't wait until he gets this letter. It's like I'm a little kid again! My son really looks forward to these every year and I would like to keep with tradition. I thought it would be fun for my Granddaughter to get a "personal" letter from Santa. I ordered this 30 years ago for my son, and now I am ordering it for my Grandaughter and niece! Children love to get this in the mail at Christmas time, and the little ornament is a keepsake! Why are there blanks for Address for Envelope #1 and Envelope #2? BEST ANSWER: Thank you for your question. Envelope line 2 would be for an apartment number. We hope this information will be of help to you. BEST ANSWER: Thank you for your question. The Santa letters will be mailed the first week in December. We hope this information will be of help to you. can I use 2 names? BEST ANSWER: Thank you for your question. The Personalized Christmas Letter from Santa is designed to be sent out to individuals not more than one person. We hope this information will be of help to you. do you have a black santa? BEST ANSWER: Thank you for your question. Unfortunately we do not have a black Santa letter. We hope this information will be of help to you. What is the latest order date to insure delivery before Christmas? BEST ANSWER: Thank you for your question. The last day to ensure Christmas delivery was on the 10th. You may still order, however we can not guarantee Christmas delivery. We hope this information will be of help to you. Is this an actual letter mailed to the child? My question Is this an actual letter sent by mail? BEST ANSWER: Actually, I ordered the Santa letter to be sent to my granddaughter. Walter Drake cancelled the order so my granddaughter never received it. I ordered the letter to be sent to my granddaughter again this year and as of today, she has not received it. I contacted Customer Service last week to make sure that the letter will be sent out due to my experience last year. I was assured that the letter will be sent out the first week of December. I am assuming that it will be an actual letter sent by mail, but as of today I cannot verify that!! My great grandsons haven't received theirs yet, but it is my understanding that they will be mailed to the child you named. My past experience with Walter Drake tells me we will be satisfied. You might like to know that I am hard to please, and I don't usually don't give compliments before the fact. Yes it is with their name in the letter and addressed to them. Also the ornament comes engraved with their name. I've done this for my kids since they were babies. And it is a different ornament each year. Thank you for your question. As long as you provide the childs address, the letter will be mailed directly to the child. We hope this information will be of help to you. The letter is the one Santa is holding in the catalogue picture. Yes and my grandchildren really love their letter from Santa. are there more than one ornament to choose from? BEST ANSWER: No. They offer a different ornament each year but you don’t get to choose. I have been ordering the letter for my daughter since she was little and we have all the ornaments hung on the tree each year. She still loves to get the letter even though she is in her early 20s! Love Walter Drake so much ! Thank you for your question. Unfortunately we only offer one ornament. We hope this information will be of help to you. I didn’t think so. The ornament that they show with the letter is what they send. No, they only have the one. Are there other letters to choose from? BEST ANSWER: I ordered two different letters with two different ornaments as multiple letters were going to the same households. I have sent these letters before and they are always well received by the grandkids. This is the first time I have bought this, but I am getting it for my 8 year old granddaughter with Downs Syndrome. Sorry I can't be of better help. Thank you for your question. This year we only have the one style of Santa letter. We hope this information will be of help to you. I haven't seen anything else in the catalog. I need this item sent to another address, is that possible? BEST ANSWER: Yes, it is possible. I've had the Santa letter sent to my greatniece at her home over the past few years and I've ordered it again this year. When you go through the personalization process, you will be asked for the address to which you want the letter sent and the name of the head of that household. In my case, that is my nephew. The letter has never failed to arrive at their home and in time for Christmas. Yes, the letters are sent to the address you want them sent to, not the billing address. Oh yes and it does not cost any more just put in the address and you are good to go !! need address in letter but mail here is only to po box so child will know santa knows her house address? I would put the physical address in the letter and and the PO box and house address on the envelope. Hope this helps. need 7 letters. Must make 7 different orders? Thank you for your question. You may place one order with 7 different Letters with different Personalization on them. We hope this information will be of help to you. Can you put the child's first and middle name on the letter? BEST ANSWER: Thank you for your question. That depends on the length of the name if it is longer then 12 characters will not fit. We hope this information will be of help to you. Yes, this has helped me a lot! Thank you for answering! Do you have anything similar for my grandgirl? BEST ANSWER: Thank you for your question. Just the one with stickers, the ornament on the pictured Santa letter is a star, not a badge. We hope this information will be of help to you. when will my grandchildren get this letters? BEST ANSWER: Thank you for your question. We send out the letters the first week in December. We hope this information will be of help to you. phone number to place an order? BEST ANSWER: Thank you for your question. 1-800-525-9291. We hope this information will be of help to you. i have 6 grandchildren will can i send the names of all 6 to be printed individually? BEST ANSWER: Thank you for your question. We suggest to order 6 Santa letters individually, so each child can get there own. We can only print a name that is up to 12 letters/characters on the letter. We hope this information will be of help to you. why is Santa letter not available at this time? BEST ANSWER: Thank you for your question. 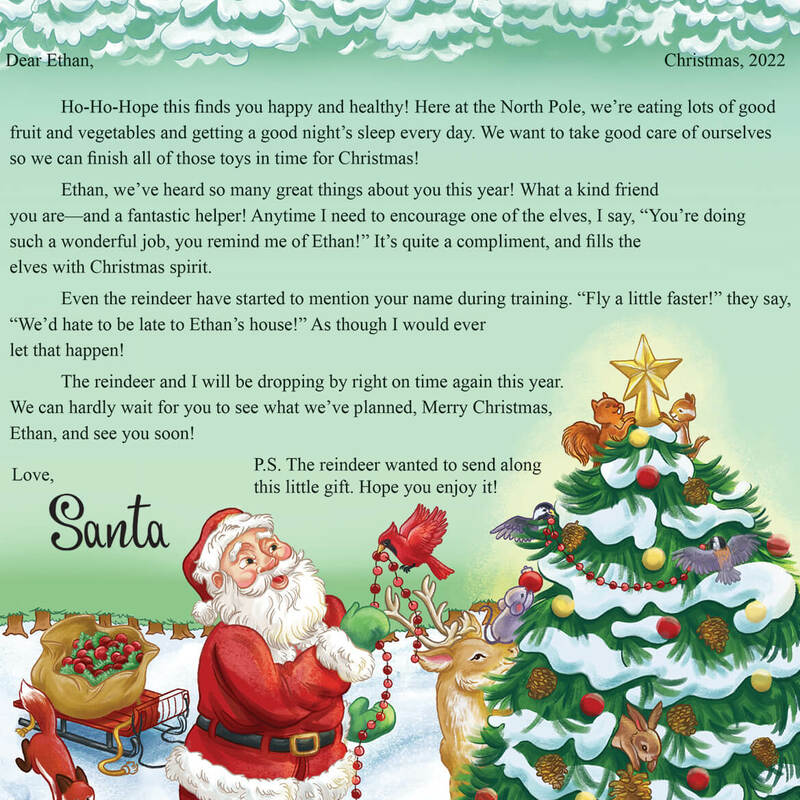 We have reviewed the Santa letter and show that it is available to be purchased and can be purchased on the website. We hope this information will be of help to you.